Cornwallis Sues for Cessation of Hostilities, 1857 fresco, Constantino Brumidi, Image courtesy of the Architect of the Capitol Now hanging in the Members’ Dining Room, the 1857 fresco by Constantino Brumidi originally hung in the House Chamber. 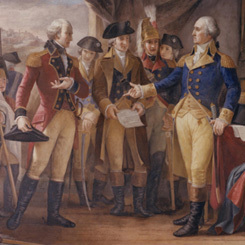 On this date, General George Washington and Lord Cornwallis’s began negotiating the British terms of surrender at Yorktown, marking the penultimate battle of the Revolutionary War. An 1857 fresco by Constantino Brumidi shows Washington in his headquarters at Yorktown, receiving a letter through Cornwallis’s emissary. The British formally surrendered on October 19, 1781. While the historic event was an unqualified success, this fresco was not. Originally located in the House Chamber, the fresco, along with the fashionable Victorian look of the newly-opened chamber, was not universally appreciated. Harper’s Weekly reported that some critics called the chamber “profuse and gaudy.” An anonymous letter to the supervising architect proclaimed that the fresco was “inappropriate and the execution execrable.” The fresco remained in place until the 1947 remodeling of the House Chamber, when the painted layers of plaster were carefully separated from the structural wall, and the fresco was lowered by a crane outside the Capitol and installed in the House Members' Dining Room where it remains today.